One of the best selling Honduran brands in our humidor, El Rey de Mundo cigars deliver a quality smoke every single time. 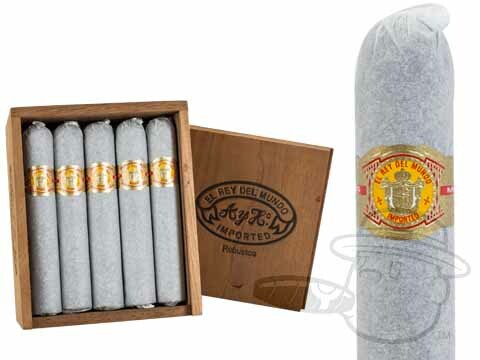 A perfect evening cigar for the regular smoker, as well as a good cigar for the novice looking to taste a legend, El Rey del Mundo is a bold and smooth stogie, sure to satisfy any aficionado. This is a followup to my previous review. Forgot to give the ratings. I have been smoking El Reys for years now. Haven't found a better cigar for the price. They always burn smoothly and evenly, the draw is always easy and smooth. Taste is excellent and rich. El Rey Del Mundo - "King of the World"
...at least in my humidor they are. Great smoke! These are my go-to, everyday cigars. They burn perfectly even with a solid white ash. They have a very firm body to them and a rich, full-bodied, slightly sweet flavor. I recommend aging them a bit and they need a bit of drying out from the humidity level at which they arrive in order to get the best smoke from them. These are full of flavor. Great price. Always have these in my humidor. Great cigar. Delivered on time. Easy ordering process! I have been buying these cigars for a long time now and they are great everytime I smoke them. Great flavor, great burn and great taste. I love a good Honduran cigar and these are a favorite. These are excellent cigars for relaxing and go good with anything. Really good cigar! El Rey Del Mundo Robusto is rated 4.8 out of 5 based on 12 customer ratings. Oscuro wrappers are very dark in color, usually black, and are made using the strongest leaves of the tobacco plant. The result is an extra-full bodied wrapper with a very distinct, strong taste. And yes, we do ship to Haiti, and any other country. Please refer to the "Help" section on our website for a complete list of policies and procedures regarding international orders.